Before I explain the photo, let’s first welcome our newest, wonderful reader: Denise, the self-proclaimed Krazy Kraft Lady. Denise is one of the most talented crafters I’ve come across. 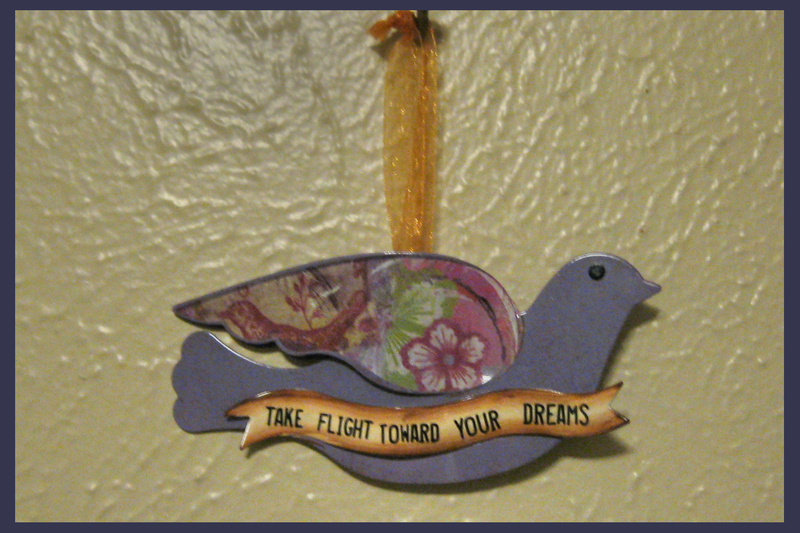 I love her KKL Primitive and folkart handmade products, and I bet you will too! I can only aspire to create her masterpieces. Welcome Denise! In my effort to downsize, simplify and save for an RV, with very rare exception I have purchased nothing this past year that wasn’t consumable – and I mean nothing, nada, zilch, zip (not counting business expenditures that have been recovered in resale at our Knick Knacks booth of course). The dream dove in the picture above is one of those exceptions. lovely buy you found. we live in a 2 bedroom house, but i only purchase what we eat or use up, i see so much i want but i just say no, saves money, cuts out clutter. I found Denise's blog not too long ago and I love it. @ Ann - One of my young niece's is learning the difference between want and need (with a little help from her mommy, grin). Recently she was in a store and declared in a very loud voice (regarding a doll)... "But I NEEEEEEED it Mommy." LOL.